One of our missions is to provide flexible cable conduit cable protection solutions for process automation and control systems for the metals industry, covering the wide spectrum of metal industry technology, ranging from refining iron ore to processing long and flat products. Furthermore, we design and supply complete Heavy Series Over Braided Flexible Conduit and Fittings systems, up to turnkey solutions for steel industry, with installation engineering based on extensive experience and on the required performance. 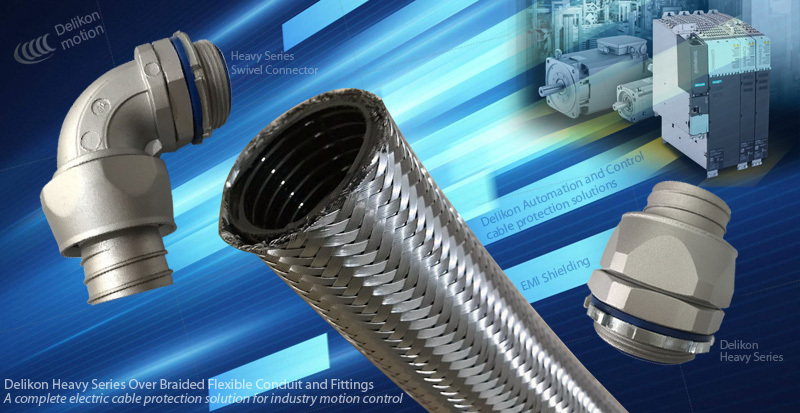 Additionally, we produce flexible conduit and fittings for instruments and sensors, designed and engineered to meet the demands from steel producers for protecting sophisticated controls and automation cables. Delikon Electric Flexible Conduit Systems for automation and control cable protection solutions cover the breadth of the industrial, infrastructure and building sectors cable management, from heavy series over liquid tight conduit to over braided corrugated nylon flexible conduit and heavy series connectors, for applications from simple machines to complex process systems wirings. Product highlight Designed for the future, the Heavy series over braided flexible conduit and fittings system offers cable mechanical protection as well as emi shielding capabilities to help you protect your Motion Control power and data cables in a safe, secure environment.